Weight regulation for hockey players can be a tough road to success. Between in the gym training, on the ice work and dry land training movements, it can be tough to get all your meals in and eat enough to gain weight with all of that activity. I just recently had to give one of my high level hockey players three different meal plans to alternate throughout the week due to his intense training regime and school commitments. 2. Proper building blocks for lean muscle tissue from the diet. 3. Proper training stimulus and loading parameters to force the body into growth. Those three rules are like a tri-pod, if one of them are knocked over it’s all going to crash. They function in their own important and independent way that is discussed throughout entire textbooks on sports science. If those three are in check, there’s nothing stopping you. 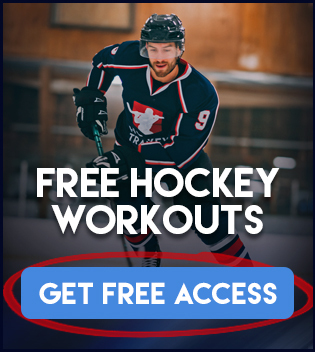 During the Off-season is where hockey players are generally looking to maximize weight gain and with the small amount of time you have to focus on this, you need to pull out all the tricks you have. 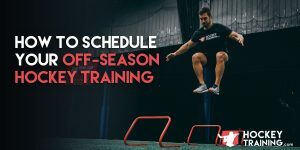 Off-season training is generally only 16-20 weeks in length (MAX, usually less than this) and there is only so much that can be accomplished. Due to the short time frame, you need to make sure that everything tactics you use in done correctly because you don’t have much “play room” for trial and error here. You need progress, and you need it quickly. Without a hypercaloric diet you can’t gain weight. Period. If you’re stuck at the same weight for months on end you’re eating at maintenance, which is the amount of food required to keep you at your current weight while supporting your current activity (these terms are borrowed from the heavily accepted model that your energy in vs. energy out determines your body weight regulation). You need to be able to eat more than enough to support your current body weight and activity levels in order to gain more weight. Put another way, you have to eat enough to maintain your current mass while also eating enough to fuel your games and workouts — then you need to eat even more in order to gain weight on top of that. This can be uncomfortable at times, yes, but is absolutely necessary. There’s no way around it. If you’re not gaining weight, you’re only eating enough to support your current weight/activity, you need to exceed that caloric intake in order to gain weight. Body weight is regulated almost entirely by caloric intake, it’s your guaranteed track of success. 160 x 18 = 2880 calories per day would be a good starting point. Calories bring about total body weight regulation, but calories aren’t tissue specific (tissue specific being muscle mass vs fat mass). Becoming tissue specific means controlling the amount of macro-nutrients (protein/carbs/fat) that are making up your current calorie allotment. For example, getting 100% of your calories in from carbohydrates is going to yield a different physique then having a more balanced intake that includes proteins and healthy fats as well. Ensuring you are getting in the proper macro-nutrient breakdown for your desired goals and activity levels is vital to ensuring your gains are quality gains. We want functional mass, not just mass. Protein (4 calories per gram): 0.8 – 1.2g per pound of body weight per day. Carbohydrates (4 calories per gram): 0.0 – 4g per pound of body weight per day. Carbohydrates have a very, very large range of intake because they are based strictly off your current activity levels. But for weight gain, generally 2g per pound of bodyweight on training days is a good start point and 0.5-1g per pound of body weight on non-training days is ideal. Fats (9 calories per gram): Fats simply make up the rest of your calorie allotment. Take the above example of the 160lbs athlete looking to gain weight, his calorie allotment was 2880 calories per day. Total calories allowed = 2880 – 640 (protein) – 1280 (carbs) = 960 calories left, which equates to 106g of fat per day. Keep in mind all these calorie estimates and macronutrient breakdowns are just that, estimates. I can’t be 100% sure what is optimal for you unless I know you and you’re current situation. Unless we are working together 1-on-1 it is up to you to gauge these requirements, assess your body weight overtime, and adjust accordingly. Listen to your body, don’t just number crunch. The numbers should be viewed as more of a compass as opposed to an exact Google Maps direction list. Training program design and proper workouts are what is going to stimulate muscle growth in an otherwise already fit person. For an underweight individual or unhealthy individual, somebody can gain lean muscle mass just simply with a change in macro-nutrients and calorie intake. But the healthy training population who has already attained a healthy body weight / lean muscle mass and is looking for more lean muscle mass to improve their game; NEEDS to train properly. This normally represents hockey players looking to add some mass in the off-season. You don’t grow in the gym, training simply creates the stimulus for growth, while eating and sleeping provide the proper environment for the real growth to actually happen. If you don’t have a proper periodized hockey training program creating a controlled overload over a period of time, you could definitely be spinning your tires in the mud. Program design is of the utmost importance to your success, and if you’re winging it or playing ping pong with a bunch of different random programs online you will plateau, fast. You don’t just eat to gain, you have to train to gain as well. Put another way, don’t complain about not adding mass if you’re spending our time doing body weight squats on a BOSU ball for “activation”. Eating 4-6 times per day is ideal. Neither 4 nor 6 is better than the other so long as you get your calories and macros in. Having a meal plan is a guaranteed approach to success in weight gain. But if you’re not on a meal plan for whatever reason, eating calorie dense foods is to your advantage as they add more bang for your buck in terms of weight gain per meal. A good example of calorie dense foods are a bag of raw nuts and mixed dried fruit to snack on between meals. 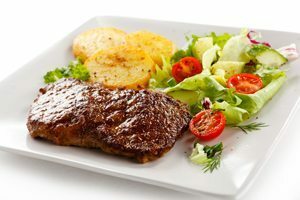 Or choosing steaks and chicken thighs over leaner meats such as chicken breast and tuna. More fat = More calories. More calories = More mass. If appetite is a problem, alternating between liquid and solid meals may be to your advantage, but relying too much on liquid meals is a defeating technique. You need to eat solid food to be solid. One of your liquid meals should come in the form of a shake post-workout with a moderate amount of protein mixed with a very high amount of carbohydrates due to the post-workout window being nearly bullet-proof in preventing any fat gain. Especially for you hard gainers. Last but not least, if appetite is still an issue even after alternating between liquid and solid meals, adding in a B-Complex vitamin is to your advantage. Deficiencies in B-Vitamins have been linked to low appetite so taking in a well formed multi-vitamin with a good amount (and good forms) of B-vitamins throughout the day can help with that. I hope this article helped shed some light and offer you some rock solid strategies you can use to gain lean muscle mass — Pick up the fork and pick up that barbell! This was very helpful, with really specific directed suggestions/advice. Reassured much of the other stuff I had figured. THanks alot!